It’s pronounced KEENWA and it’s been called the grain of the gods. Laughably, one of its closest relatives is the tumbleweed. It originated in South America in the Andes mountains. It’s one of the few grains that is a complete protein and so can replace meat-based proteins by itself. It’s also very high in calcium so can be used beneficially by those who are lactose intolerant, or just don’t like milk (like me.) It was first domesticated in 400 bc but was eaten long before then. The Incas referred to it as the “mother of all grains” because it could stave of starvation and was so versatile and flexible. They held it sacred, and the king would sow the first seeds every year using gold tools. 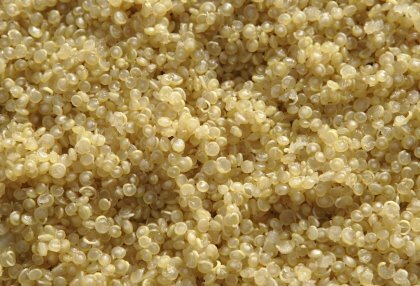 When the spanish conquered the Incas, they looked at quinoa as slave food and according to history, they actively suppressed its cultivation. Luckily it didn’t die out, and was “rediscovered” last century. Quinoa cooks very quickly, in as little as ten to fifteen minutes. It can be used as a substitute for any grain in nearly any recipe, but mostly I used it in place of rice dishes. It can be added to soups, salads, or stand on its own as a side dish. It can be boiled, or sauteed, or baked, cooked in nearly any way imaginable. It has a light nutty flavor when it’s on its own, but picks up the flavors of whatever it’s cooked with. When choosing quinoa in the store, be sure to find the box that says it’s rinsed. 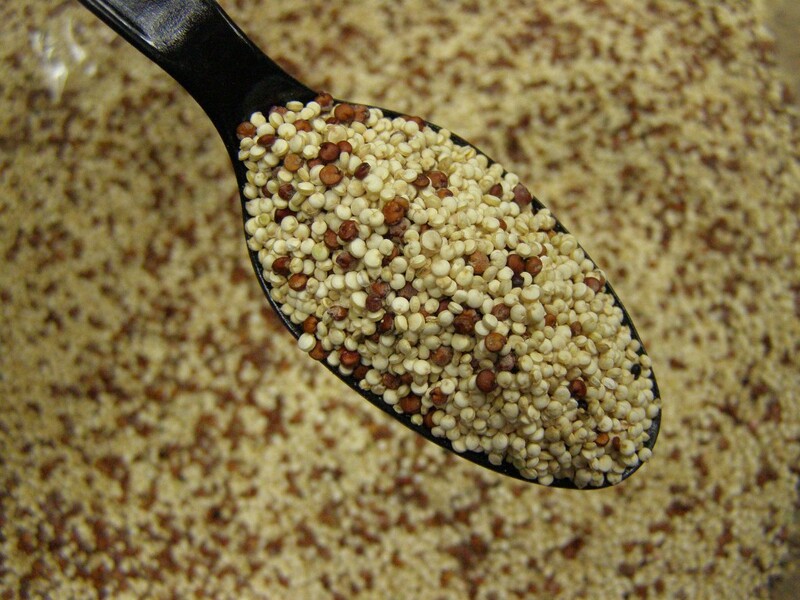 Quinoa has a high saponin factor, like a waxy outer layer. If this isn’t rinsed off, it has a laxative effect. You can rinse it at home but it takes several minutes rinsing in a fine mesh strainer, or cheesecloth. It’s simpler to buy it pre-rinsed. There are also different varieties from the standard white, to red, to black. Each has a slightly different flavor so it’s worth the time to find out which you like best. I generally stick to the white variety unless I want to add color for visual impact. After it’s cooked, quinoa turns translucent and shows a small dark spot in the center. As I said earlier, quinoa can be used as a replacement for any grain in nearly any recipe. It also makes a highly nutritious sprout (remember post #55? ), but I’ve never tried this myself. Quinoa is also making an appearance on store shelves in side dish mixes. I’ve tried one or two of them and they’re good, but I prefer my own concoctions to prefab. Here’s my favorite way to make quinoa. I call it “Quinoa Salad”. Inspired, right? Cook a half cup of quinoa by putting 1 and 1/2 cup cold water in a pan. Rinse the quinoa if it hasn’t been done. Put the quinoa in the pan and turn on heat to medium. Bring to a boil, reduce the heat, cover, and simmer for 10-15 minutes until all liquid is absorbed. Set aside and allow to cool to room temperature. While the grain is cooling, chop tomatoes, cucumber, onion, carrots, sugar peas, and cheddar cheese into small, bite-sized chunks. Chop fresh parsley, cilantro, and mint. Place all veggies, cheese, and herbs into a large bowl, add 1/4 cup of olive oil and two tablespoons of rice wine vinegar. Toss to coat liberally. Add quinoa and mix completely. Chill thoroughly. Serve cold with a squeeze of fresh lemon just before serving. I usually serve this with grilled chicken, but you can serve it with anything. The key is to make sure there are enough vegetables and cheese for the amount of grain. It’s called Gorp and it’s been the mainstay of hiking grub since the world began. Well, maybe not that long, but I’ve been aware of it since at least the ’60s. It’s also commonly known as trail mix. At some point in the past, someone decided that a cheap, longlasting, stick-to-your-ribs, nutritious snack was necessary for anyone out in the woods. I suppose due to personal preference, that someone put peanuts together with raisins and other non-melty but tasty treats and put it in a bag to take with them as they went hiking. Then someone else thought it was a great idea. You see where this is going. 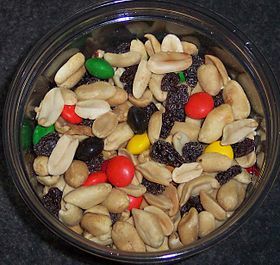 Trail-mix/gorp is actually a pretty good snack and if it’s put together right, it’s really tasty and nutritious. The basic mix is peanuts, dried fruit, and non-melty chocolate. Most of the time, the chocolate is either M&Ms or chocolate chips. If the day is hot, stay away from chocolate chips. As with any recipe, there are as many variations are there are people who make it. When I make it, I add pretzel bites, oyster crackers, M&Ms, cashews, pecans, walnuts, and a small sprinkle of salt. A friend uses various childhood cereals with peanut butter chips and throws in garlic and onion powder. Sounds disgusting, but he likes it. Another friend makes her own by mixing Chex cereals, cheese crackers, peanuts, dried peas, small beef jerky bites, and dried dates. What you’re aiming for here is a mix of carbs, long-lasting proteins, and quick-acting sugars. The mix should taste good, or you won’t eat it. Gorp makes a great substitute for meals when you either don’t want to stop, or don’t have time to stop. Almost anything can go into it. Coconut, citrus peels, seeds, nuts, dried fruits, breakfast cereals, dried vegetables, various spices and herbs, candies, marshmallows, crackers, cookies, pretzels, etc. The most important thing is to make sure it tastes good to you. Post # 86 Frittatas Are Eggs! January 18, 2013 at 12:44 PM | Posted in Uncategorized | Comments Off on Post # 86 Frittatas Are Eggs! Okay, I couldn’t come up with a cool or cute headline for today’s post so my quirky sense of humor came up with Charles Heston screaming “Soylent Green is people!” at the end of the movie. So, Frittatas are eggs! Since it’s been an eggy week, starting with Green Eggs and Ham and moving into Shirred Eggs, I decided to end the week with eggs and tell you about frittatas. But first, Kitchen Nightmares update. There is no update. I did zero work on the kitchen this week. I used the kitchen a lot, baking bread, making cake, fixing lunches and dinners, gallons of soup, etc. But no unpacking got done. Call me lazy, despondent, whatever. I did, however, start the second novel, so I guess that’s something. Now, on to the eggs! Okay, enough about that. Let’s dish eggs. Eggs are about the most versatile food around. They’re also about the most nutritious. I’ve blogged about egg salad, omelets, shirred eggs, and more. I’ll be talking about eggs a lot in upcoming posts over time because of their versatility. 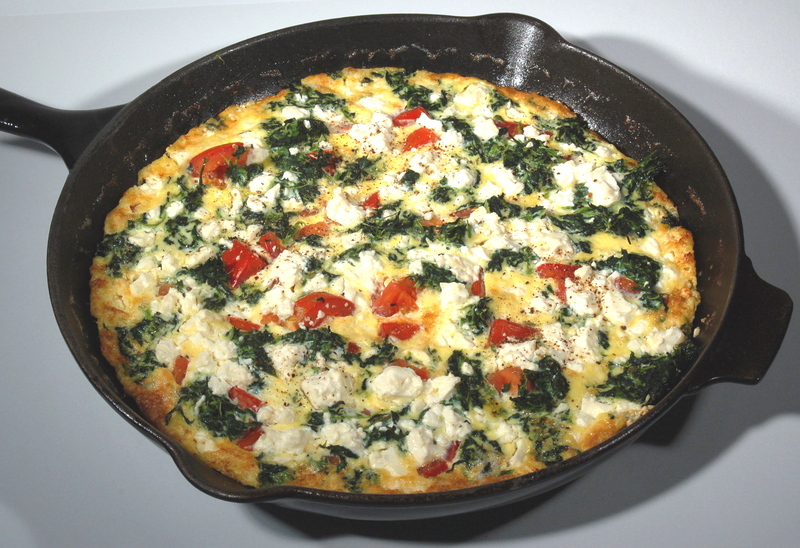 A frittata is an Italilan version of a quiche or omelet. The primary difference is that the frittata is typically not folded or baked. It’s cooked in a skillet until set. The bottom is very brown and crispy, while the top is still soft and creamy. One variation has the frittata being either flipped to cook on both sides, or grilled under the broiler to cook the top. The broiler method is used when there is cheese on top so the cheese will melt and brown into a crust. Think of an egg only pizza and you have the idea. Frittatas are cooked in a skillet and can be as large or as small as is needed. They can be filled with anything at all that’s at hand. I’ve seen frittatas made with leftover spaghetti noodles, or home-fried potatoes, or leftover salad. Frittatas can be elegant or home-style. They’re as versatile as the ingredients you have on hand. First, you need eggs. Then, you need whatever fillings you’re going to use. As an example, I’m going to describe a frittata I made a couple of nights ago for Partner/Spouse. Partner/Spouse was working very late and didn’t arrive home until nearly 9pm. FiL and I had made omelets earlier, along with home-fried potatoes. Our omelets had cheese, bacon bits, onion, and mushrooms. Partner/Spouse doesn’t like mushrooms (I know! Right?) and shouldn’t eat cheese very often. So what we were left with, for his omelet was onion and bacon bits, along with fresh cooked potatoes. While I was heating the potatoes, the idea of a frittata came to me. So I broke three eggs into a bowl, scrambled them well, and added about a tablespoon of bacon bits. Then I added the onion to the potatoes and let them cook together until the onions softened and released their flavors. While the pan was hot, I poured the eggs around the edge of the skillet, then into the center so they were evenly distributed. While the eggs were cooking, I sprinkled more onion and bacon bits over the top. Once the eggs had cooked for a couple of minutes, I used a wooden spatula to loosen the frittata. While the eggs cooked, I moved the frittata around the skillet every thirty seconds or so to keep the bottom from burning and to evenly cook the egg top. After a few minutes, the eggs on top had set so I slid the whole frittata onto a plate. I put on salt and pepper and served it up with some fresh bread toast. That’s a frittata and that’s really how easy it is. Start with a hot skillet, but not so hot that it burns the eggs. Mix the eggs and add any ingredients to them that you like. Put any fillings that need to be in the pan before the eggs to the pan and allow them to become hot. Pour in the eggs and distribute them evenly. Cook, garnish, and serve. Fillings are limited only be your imagination and what you have on hand. Experimentation will yield surprising results. You can make a frittata for one or for a family. Enjoy and let me know if you try one! Post # 85 Shirred Eggs, What the Heck Are Those? Shirring eggs refers to a technique for cooking eggs in the oven. So, you can just as easily and correctly call them baked eggs. They’re called Shirred eggs because that was the name of the dish they were traditionally cooked in about a century or so ago. Well, maybe not that long, but a while back. Nowadays, you can bake them in just about anything and still refer to them as shirred. I only call them shirred eggs when I’m trying to either confuse or impress someone. But here’s the scoop on them. Baked eggs can be cooked as soft or as firm as you like. The yolks can be hard or runny. You can put as many eggs in the dish as it will hold, or you can cook a single egg. The basic recipe is insanely easy, but the variations can be insanely complex. Any way you prepare them, they are a very tasty and very nutritious addition to your kitchen notebook. Preheat oven to 325. Make certain the oven is preheated completely, do not put the eggs in a cold oven. 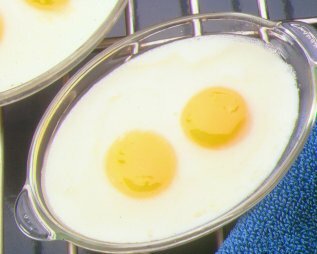 Gently crack one to three eggs into a lightly buttered ramekin or other baking dish. Be careful not to break the yolks. Sprinkle with salt and pepper to personal taste. Spoon a tablespoon of milk or cream over the eggs to keep them from drying out. Cook for ten minutes then check them for doneness. Check every two minutes after that, being careful not to overcook. The whites should be firm and set while the yolks should be only partially cooked and just beginning to set. Serve immediately. Now comes the fun ways to do them. Try baking them in little tartlets. Add crumbled bacon at the start of the cooking. Sprinkle cheese after they come out of the oven. Place them on a bed of cooked rice in the baking dish. Place them on a bed of cooked greens, such as spinach, in the baking dish. Add fresh herbs to the egg before cooking. Make a bed of chopped ham and potatoes in a larger baking dish and nestle several eggs in small pockets to bake. Here’s the most unusual way I’ve seen to bake egss. Take a 12 inch pizza dough ball and spread it out on a round pan. Put a medium white sauce over the dough, then add fresh herbs over them. Add your favorite cooked breakfast meats such as sausage pieces, chopped ham, crumbled bacon, etc. Add your favorite cheese. Nestle several eggs in pockets around the pizza. Bake until eggs are done. Add more cheese and serve. My favorite way to fix them is to make a bed of parmesan cheese, bacon bits, and cooked spinach in a 4-5 inch ramekin. Spread the spinach mixture up the sides. Break two eggs into the center of the bed and lightly salt and pepper. Sprinkle a small amount of parmesan over the eggs and bake for twelve minutes or so until the eggs are done. Serve immediatly with toasted bread of some sort. About eight hundred years ago, when my little brother and I were still younger teenagers, I was walking through the kitchen and saw him messing with something at the sink. “What are you doing?” I asked, mostly from boredom, but partly from curiosity. When he was in the kitchen, you never knew whether to run or call the police. “Making some eggs.” he replied, still bent over the sink. Intrigued, I walked over to him to see what he was doing. He was stirring an egg mixture in a bowl. Instead of the yellow I expected to see, it was a funny greenish-brown color. He grinned at me, happy to have surprised me into cussing out loud. “Yeah, since eggs are basically yellow, if you added just blue, they would turn green. I think.” I suddenly realized I was one half of a conversation about how to turn eggs green on purpose. I turned to the fridge and found a package of ham lunch meat. It was full so I took some and made a quick ham-and-cheese sandwich while watching him progress with his culinary enterprise. He turned to the stove and scrambled up the eggs, then fried a few pieces of ham in the same pan. He sat across from me at the table eating his horrible looking eggs and ham. He also made toast. “How is it?” I asked after a few moments. As I’ve said before about my little brother, he takes cooking risks and always eats what he cooks.